So it would appear that blogging is a holiday only activity for me now. I can’t apologise any more for my infrequent posting but I’ll try my best to not disappear completely. I suppose the reason for my lack of writing is three-fold. Firstly, I spend most of my day talking, generally saying the same thing over and over again in various different ways, phrasing and rephrasing over until I’m convinced I’m never going to get through. After a day like that, my brain loses the ability to produce any more words. Secondly, spending time doing after school stuff with the kids is far preferable to spending time alone in your poky little studio flat and finally, it’s hard to get motivated when you rarely have anyone to cook for. The last point makes the biggest difference. I really need to invite more people over for dinner. However one thing recently proved to me that, at heart, I am definitely still a foodie. That was the look on my mortgage broker’s face when I put down my anticipated food budget for next year. Aprroximately three times the average. Whoops. But,then again, good quality food costs money and I’d much rather have this swordfish…..
than that extra glass of wine in the pub on a Friday. Let’s face it, if I had that extra glass of wine I probably wouldn’t be capable of cooking properly and I’d probably convince myself to have a skanky chinese take-away. I’m sticking with the swordfish. The real gem in this meal was the sweet and sour potato salad. it was a first for me but definitely one to become a regular. It’s Sicilian in origin, simple to make and a light reefreshing accompaniment to the fish. Cut narrow slashes into each side of the steak, just a few millimetres deep and about 1 inch appart. Mix the rest of the marinade ingredients with just enough oil to lightly coat the fish. Brush this over the fish and leave to marinate for at least two hours. Shaking off any excess marinade from the fish, griddle it on each side for about two minutes, depending on the thickness of the steak. I aim for the fish to be just pink in the very centre. Take it off the heat, wrap in foil and allow to rest for about 5 minutes. Serve with chopped parsley, lemon for squeezing over and the potato salad. Sauté the potatoes in the olive oil over a high heat until crispy on the outside. Turn the heat down and add the onions and cook until the onions are soft and the potatoes are just cooked through. Dissolve the sugar in the vinegar. This will be the salad dresing, so taste it and adjust quantities to your taste.Add this to the potato mixture, stir well, bring to the boil for just a minute, then remove from the heat and allow to cool to room temperature before serving. We’ve all been complaining a lot about the weather this summer. It has truly been a mixed bag, almost like Britain has developed a monsoon season. To make it worse, the rain likes to make itself manifest at weekends or at around 6pm. The weather is trying to spite office workers! How rude! During the day, it has certainly been hot enough to go out with just a t shirt on, but my leather coat remains in my bag in case the heavens decide to open a little bit earlier than expected. The rapidly changing temperatures really confuse my appetite. As I went food shopping last Tuesday, it was a very warm and humid 22 degrees. I had a bit of a bargain binge, picking up half price duck breasts, and some lamb neck fillet reduced from £5 to £2.05 and half price broad beans. I was thinking lamb kebabs using some super cheap veg from the Turkish grocers and a broad bean and feta salad (feta also seems to be one of the grocers’ cheap items). Sadly, as I went to leave Sainsbury’s I saw that it had decided to storm properly, complete with a bit of thunder and lightning. From the bargain bin: approximately 500g of lamb neck fillet and 400g unpodded broad beans. From the windowsill: the remains of the poor mint plant, which is now properly dead. Total spent on the meal: £2.02 for the lamb. 40p for the parsley and £1.37 on the broad beans, so under £4 for two generous servings. 2 handfuls of frozen peas, cooked. Brown the lamb in batches over a high heat. Place in a saucepan of cold water, bring to the boil, then immediately turn down to a simmer. Over the next five minutes or so, skim the scum that rises to the top of the water off with a wooden spoon. Once no scum is left, drain the lamb and place in a pan with the vegetable stock. Bring back to a simmer. After 30 minutes, the lamb should be tender. Strain off the liquid into a seperate saucepan, reserving all the solids and boil until reduced by half. Remove from the heat and allow to cool for 2 or 3 minutes. This is to stop the egg mixture from curdling when it is added. Beat the egg and cream in a bowl. Add to the reduced stock, stirring constantly. This should thicken the sauce although you may need to return the pan to a low heat for this to happen. Stir the lamb and other strained solids back in. Add the peas and broad beans. Warm through, taste, adjust seasoning. Serve with the tagliatelle, squeeze over some lemon juice, garnish with mint leaves and wedges of lemon. Note: to prepare the broad beans: remove the outer pods and discard. Put the beans in their white casing into some cold water. Bring to the boil. After 3 minutes, drain and pour over cold water to cool them. When cool enough to handle, squeeze the beans. They’ll pop out of their casing and should be almost cooked. If you’ve never tried lamb with lemon in a dish, you should try it. They pair up remarkably well. Sharp flavours cut through the natural fattiness of the meat. I noticed that the supermarket packaging suggested that lamb neck is grilled or fried. I suppose this works too, but it is amazingly tender when braised slowly like this. Now, what to do with that duck….? My food blog has had an unintended side effect since I started work as a teacher. It wasn’t all that suprising that my year 12s found their way to my blog from the maths pages I wrote for them but, how the year 9s discovered this place so quickly, I’ll never know. I guess that’s the power of Google for you! My newly acquired year 13 class have also become aware of the site and on occasion will use it as an excuse for avoiding practising statistics questions. The following conversation happened three quarters of the way into a practice lesson at the end of last term. This comment came from a student I’ll refer to as J. He is a confident lad who, on occasion, has succesfully confused me by switching places with his identical twin brother and who isn’t easily persuaded to get down to work. However, the Highgate maths department handbook had taught me the exact phrase to use in this situation. Pity it never works. “J, you’re in Set 6*. The only reason you aren’t in Set 7 is beause we don’t have enough staff free to teach seven year 13 groups now. You need all the practice you can get.” At this, J started writing again. Around 30 seconds later, he’d given up. As I considered reaching for my book of detention slips, another student piped up. I couldn’t help but raise an eyebrow to this. With my political ideologies quite firmly rooted in the right, I’d never believed in the term ‘overpriveledged’ before. However, as someone whose most distinguished treat as a child was a trip to the local Harvester, some of the boys at school were making me wonder. This question came from the hard working member of this small group. At this point I conceded that no more work was going to get done that lesson and gave in. But what to answer? Poor boy. What a thing to ask. When I was 18 in my own maths class, this would have been a perfectly reasonable question. However it seems that at Highgate, if you haven’t eaten game, you haven’t lived. The young lad was subject to a short torrent of abuse and a projectile pen. 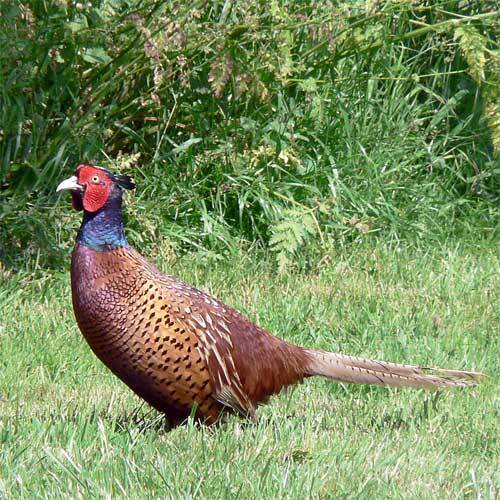 Oddy enough though, the other five in the class couldn’t quite define game themselves other than to say “It’s like pheasant and stuff.” I would have said game is any wild animal that is eaten as food, but the definition is slightly wider. So, for the young man in question, this is some game. Here is some game that I’m going to cook. Here it is after preparation for cooking. here is what you can make with it…. Preheat your oven to gas mark 2-3. Brown the rabbit pieces on all sides. Place in a casserole dish that fits them snugly. Sweat the onions and garlic with the oregano in the olive oil until soft. Add the tomatoes, red wine, puree and olives. Stir well and bring to a gentle boil. One the mixture has reduced to a thick sauce, stir in half the basil. 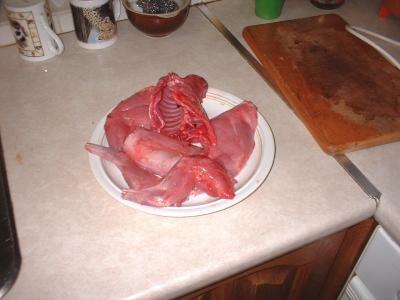 Pour the sauce over the rabbit pieces and place in the oven. After three hours the rabbit should be tender. Pour the sauce off into a wide saucepan and bring it to a bubble to reduce it. At this stage you can adjust the ingredients to taste as much a you like. Stir in the remaining basil. Taste, adjust seasoning and serve the rabbit with the sauce poured over it with some soft polenta with parmesan or, if you’d run out like me, with some penne tossed in parmesan and parsley. * We set by ability with 1 being the highest. Is it me, or has this been one of the coldest and most miserable winters ever? Perhaps it was the lack of a decent summer that did it, or perhaps it is the daily 75 minute trek beginning at 7am that I now have to endure, but this winter has definitely made me more grumpy than I’ve been in a long time. * Within ten minutes of leaving the house I find I lose all feeling in my hands, feet and face and this really irritates me. I find it even more irritating that, despite the near arctic temperatures, I still end up breaking a sweat from the effort of climbing Highgate Mountain. Someone needs to build a chairlift for that hill. The one advantage of working at the highest point in London is that it provides some fairly pretty views. On a clear day, from the top floor of our science block, you can see all the way to Kent and,looking out from the top of the maths block after it gets dark, the glittering lights of Central London look quite stunning. However, this is poor compensation for the hypothermia induced by standing on top of an extremely windy hill in sub zero temperatures at midnight, trying to hail a taxi home. I know that there are some good things about winter (pheasant springs to mind, and venison casserole) but this week I just wanted to put myself in a state of total denial and pretend it was mid July. It was time to make something packed with mediterranean flavours to remind me of the sunshine we’ve all been missing so much. At least 12 hours before you’re ready to cook, take the chicken and use your fingers to loosen the skin from the breast meat by pushing your fingers under the skin at the neck end. Make a nick at the bottom of each leg and loosen the skin from the legs too. Peel one of the oranges. Slice the flesh as thinly as you can and push it under the skin of the chicken so the breasts and legs are completely covered. Push down on the chicken skin gently so the juice from the orange is releaed onto the meat. Push the rosemary sprigs under the skin of the chicken so that they are in direct contact with the meat. Cover the chicken and leave it to marinate in the fridge for at least 12 hours. In the meantime, make some orange infused butter by zesting the second orange, and mixing the grated zest with 100g of melted butter. Leave this to infuse for a few minutes, then transfer the butter to a container and refrigerate until ready to use. Ten minutes before you’re ready to cook your chicken, preheat your oven to gas mark 7. Remove the orange pieces from under the chicken skin but leave the rosemary as it is. Push a chunk of the orange infused butter between each side of the chicken breast and the covering skin. Do the same to the chicken thighs. Roast the chicken for ten minutes at gas mark 7, then turn the heat down and roast for a further hour at gas mark 5, or until the juices run clear when the thickest part of the chicken thigh is pierced with a skewer. Remove the chicken from the oven, cover it with foil and let it rest for 20 minutes before serving. Place the peppers and garlic cloves on a baking tray under a medium grill until the pepper skins are blistering and charred. Remove them from the grill and leave until cool enough to handle. Peel the peppers, roughly chop the flesh and place in a blender. Squeeze the garlic cloves from their skin and add to the pepper along with the paprika and chicken stock. Blend until smooth. Transfer to a small saucepan and bring to a gentle bubble. After around 5 minutes the sauce should be a good consistency. Soften the onion over a low heat in about a tablespoon of olive oil. When soft, add the garlic and courgettes and fry for another two minutes. Add the rice and stir to coat with the oil. Fry gently for another couple of minutes. Repeat step 4 until the rice is cooked, then stir in the parsley. Taste and season. Carve the caicken and serve on the saffron rice surrounded by the pepper sauce. Garnish with more parsley and rosemary. *and if you remember how grumpy I was last year, you’ll know that’s saying something. I’m often looking for ways to do lamb liver, mostly because it is very, very cheap and quite tasty. Unfortunately most people seem to reserve it for liver and onions or a tomatoey pasta thing. So I was rather delighted when I came across an idea in a Turkish Recipe. This suggests you cook the liver with pernod, peppers, parsley and onions. The result was really delicious! It was a bit dry so I added a bit of chicken stock to make more of a sauce and then added a lot of ground black pepper. Really, if you like liver try this! The vegetables are just allowed to sweat until soft, then mixed with pernod, stock, black pepper and parsley then mixed into a pan of cooked lamb liver. Who’d have thought of combining aniseed and liver? Well, apart from the Turks. The downside to this recipe is that pernod is expensive. This didn’t bother me last night as I hadn’t paid for it but I might try and recreate it with ground star anise some day. During the last week I’ve been trying as hard as I can to get through everything in my freezer in preparation for moving out. I’ve done pretty well - by last night all that was left was a bad of frozen sweetcorn and an octopus. The sweetcorn can go - no one can eat that much in three days - but I thought it would be a shame to waste the octopus. The problem was I’d not had much luck with octopus before. This one was one of a pair. I’d had the other back in February and it was something of a disaster. I tried to tempura batter it but the batter fell off and sweet chilli sauce didn’t really work with it. I’d expected it to taste like squid but it is much more meaty! I needed inspiration on how to cook it. Fortunately, Gaynor on the BBC food boards came to my rescue with a great idea of simmering the octopus in red wine, tomato, garlic, chilli and cognac. It tasted very good indeed ,although I overdid the chilli a bit. But the best thing about this is, you can’t see it is octopus. Not a tentacle in sight. This is the way to introduce squeamish eaters to new things! Hide iit in a richly coloured sauce! You could probably convince them it was chicken until they’d taken a couple of bites. I’m sure most red meat eaters would like the flavour. I thought about trying this on my “no fins or wings” housemate but he’d already seen me cutting its legs off. I don’t think he was too impressed. Never mind, I’ll try it another time! I can’t believe I had to change the title of this post because no one has heard of Cephalonia. Honestly, if it isn’t Corfu or Rhodes, no one cares. This is another meal I really didn’t intend to blog, but it turned out really, really good! The recipe came from this Waitrose page and I only made minor alterations to it. I added a bit more of each of the spices and threw in more raisins. I certainly wouldn’t have thought up that combination of ingredients myself but it really works. 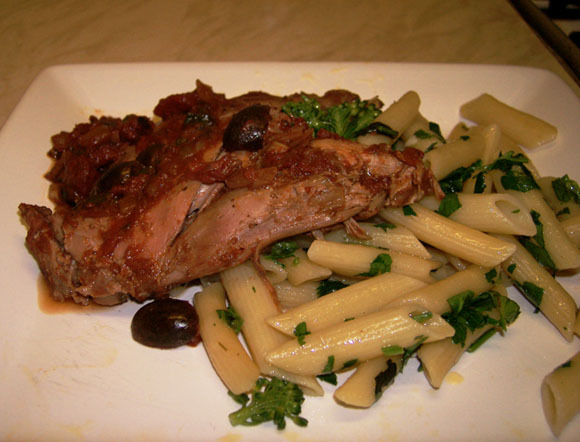 The raisins disintegrate completely in the stew, adding sweetness. The squash gives it texture and the peppers add a little bitterness. I think I should cook Greek more often - I love savoury dishes that have cinnamon and cloves. I particularly liked the idea of tossing the pasta with marscapone and nutmeg. Delicious! This happened in true “Ready Steady Cook” style last Sunday. There was a French rabbit in the freezer, chorizo in the fridge, a big pan and not a lot of space anywhere. Paella was the obvious choice. Fortunately, it turned out to be a tasty choice too, although its construction turned out to be quite stressful. It should have happened like THIS. But that would be far too easy. Problem number 1: No Paella rice. Solution - substitute Japanese sushi rice and believe it or not… it worked! Problem number 2: No red pepper. Solution- stir in some red pepper soup and put in fresh chopped tomato for colour. Problem number 3: No herbs. No solution to this one. I just prayed there’d be enough herbiness in the stock to make up for it. Problem number 4: The chorizo was covered in a shrink wrap plastic that I mistook for the chorizo skin. I’d added half the chorizo before I noticed and spent a while picking plastic out of the pan. 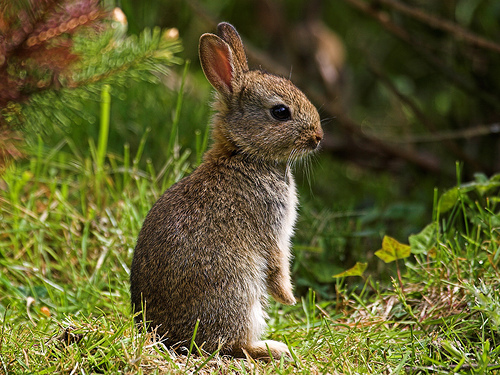 Problem number 5: The rabbit was looking at me funny. No - not really a problem but why leave the head on the rabbit when packing it? It’s pretty useless. Isn’t that weird? Guess it isn’t in France. Also we had a freak rabbit with a disturbingly big liver. After all that we eventually had a paella that was very nice apart from the occasional bit of chorizo plastic floating about. We paired it with a nice Rioja and some dolmades we found in the freezer.